If Martians were to visit Earth would they be perplexed to find that some folks need a reminder to celebrate each year of their lives? Do you mark your birthdates with cake and a bit of frivolity? Do you spend any quiet time on your birthdays to reflect on the life path you have thus far taken? Do you eagerly anticipate and map out the trajectory of the next year and all the subsequent years of your life? Your life was preceded by that of billions of humans and you live among billions today, but have you considered how completely unique you are? The exact footprint of your life on earth has never been mapped before and cannot ever be duplicated. You and our fellow humans are curious as to how we got here, why we are here, and what’s going to happen as we exit this world, but the only thing we can truly prove is that we are here right now. But have you noticed that a lot of people (and maybe you are one of them) are not enjoying our “right now”? 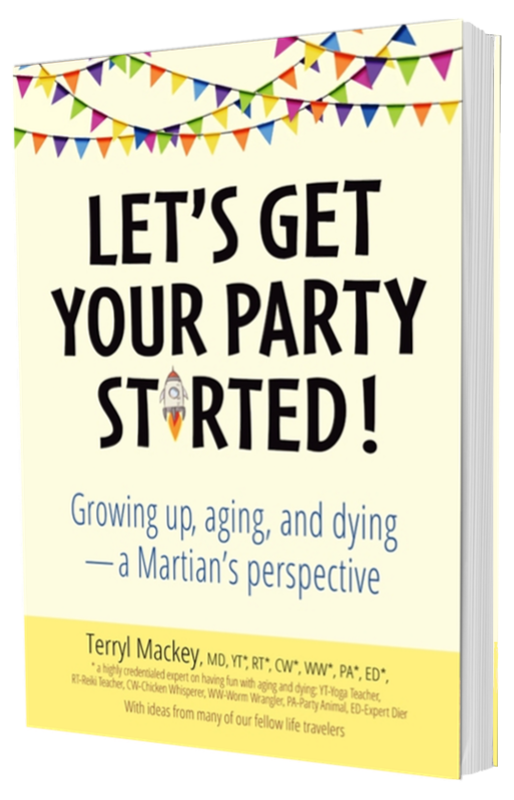 want practical, fun ideas to celebrate every age and phase of life to get your party started! The author considers herself an expert “dier” due to a few near-death episodes, which didn’t involve any cool out-of-body stuff, but did kindle a lot of interesting ideas and questions about why we think what we think regarding each phase of our lives. This sometimes amusing, sometimes quite serious book is not about whether there’s an afterlife; it’s about you in the here and now, filled with many ideas and questions for you to ponder. Have you ever wondered why you thought that you would never age? And even though we all rationally know that we will die have you ever thought that somehow you will be the first human not to die? Does it seem that our lives are segmented to the young, the middle-aged, and the elderly rather than a seamless continuum of birth to death? Did you awaken today with curiosity about the interactions that you will have? Were you excited about the adventure? Or perhaps did you wake up dreading the course of the day? Were you feeling lighthearted or fearful? then join me for an in-depth (never to be mapped again in all future human history) examination of your amazing life. Let’s get your party started! To learn about Barn Swallow Publishing … click here.